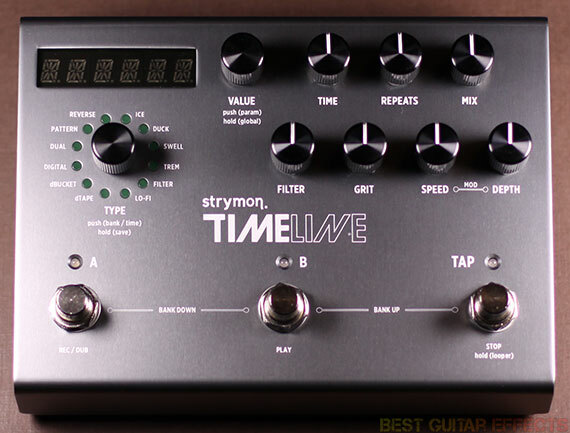 Strymon TimeLine Review – Best All-Around Delay Effects Pedal? In a few short years Strymon have quickly risen to become one of the most highly-regarded boutique pedal builders in the business. Guitar pedals such as the El Capistan dTape Echo and BigSky Multi-Dimensional Reverberator that harness unparalleled DSP power to produce immaculate sounds while remaining easy and intuitive to use are part of a growing catalog of products that are each at the top of their class. And with a drive to go above and beyond the competition, the TimeLine is Strymon’s bold attempt at creating what could be the be-all and end-all delay pedal. Featuring 12 painstakingly crafted delay machines, 200 presets, and a routable 30 second looper, the TimeLine looks like a solid contender for the best all-around delay pedal right out of the box. And this pedal features complete MIDI implementation, allowing control of every conceivable parameter from a MIDI controller or sequencer program. I’m ready to plug in and play, so here’s a full rundown of the features before we dive into our Strymon TimeLine review. Visit Strymon for more info about the TimeLine. Whether you want a delay pedal that you can just plug in and play or integrate into an impossibly complex guitar rig, the Strymon TimeLine offers a level of simplicity and incredible depth that few pedals can even come close to matching. This is one pedal that certainly lives up to the lofty hype surrounding it on every level. Perhaps what’s most surprising about the TimeLIne is that it offers a range of sounds and uses for just about any guitar player, regardless of what kind of delay you’re looking for. There’s a certain breed of guitarist that wants their delay pedals to be dead simple. Just give ’em 3 knobs and that’s it. Maybe that will always be the case for some people, but there’s an ease of use and gentle learning curve to the TimeLine that warrants a second look for even the most stubbornly traditional guitarist. Besides, let’s face it, what really matters is tone, and the TimeLine has tone for days. To get a feel for the TimeLine I started with the Digital machine, selecting it with the Type knob and turning the bottom row of 4 knobs (Filter, Grit, Speed, & Depth) counterclockwise. What’s left? That’s right, a 3-knob digital delay with the most essential controls for Time, Repeats, and Mix. The Digital machine is a prime example of the TimeLine’s ultra-high sound quality, providing perfect replications of your playing and setting the stage for the machines to follow. The TimeLine’s dry delay tones sound great, but things start to get more interesting once you start sculpting your tone with the bottom row of knobs. The Filter control is the primary key to dialing in the tone of your delay sounds. In most of the delay machines the Filter knob darkens the tone as you turn it towards noon, reducing low-end and bringing back some highs past 2 o’clock for a wide range of tonal coloring. The Grit knob adds distortion and artifacts to your delays for a more saturated tone. If you don’t want your delays all clean all the time, tweaking the Filter and dialing in some Grit will add some pleasantly “analog” character to your repeats across most of the delay machines. The other 2 knobs, Speed and Depth, comprise the Mod section, essential for adding movement and interest to your delay sounds. The Mod controls will certainly give your delays a greater sense of dimension, and great results can usually always be achieved with even just a subtle use of these parameters. 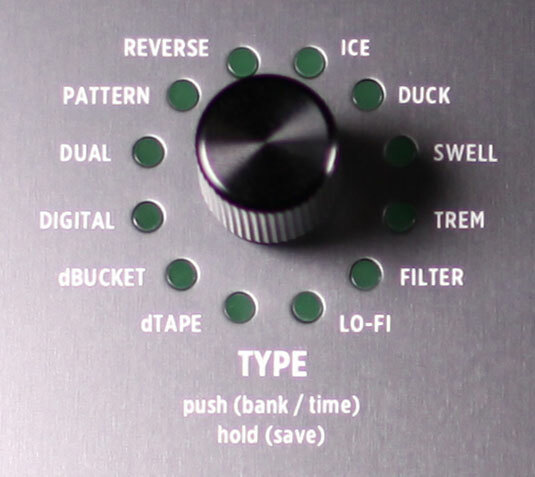 The dBucket and dTape machines have a few different knob functions compared to other delay machines and also bring up some points for comparison with Strymon’s popular Brigadier dBucket Delay and El Capistan dTape Echo pedals. The dBucket’s Filter control provides a dry delay sound at noon and gets progressively darker or brighter depending on whether you turn it clockwise or counterclockwise, respectively. The dBucket’s Grit knob functions as a Bucket Loss control, reducing the fidelity of the repeats and adding noise at higher levels. These machine specific parameters serve to create a more immersive and authentic analog delay experience. The TimeLine seems to trump the Brigadier with deeper modulation control (Depth & Speed instead of just Mod) and 5 notes divisions (versus the Brigadier’s 3). But while the TimeLine’s dBucket features 2 delay ranges, Single (40mS-400mS) and Double (80mS-800mS), the Brigadier offers 3 delay modes with delay times up to 5 seconds. Of course some of these longer delay times are less commonly used, and the TimeLine can still tap in delay times that exceed 800mS. I was able to consistently tap in delay times around 2 seconds with ease. The TimeLine seems like a solid substitute for the Brigadier if you’d like to cover what that pedal offers and a wealth of delay tones beyond. The El Capistan has become immensely popular since its debut and is the go-to tape echo of choice for many professional guitarists. It’s a Best Guitar Effects favorite, too. The TimeLine’s 4 bottom knobs take on similar functions to ‘ole El Cap, with the Filter, Grit, Speed, and Depth knobs controlling Tape Age, Tape Bias, Tape Crinkle, and Wow & Flutter, respectively. (For more about those functions check out our in-depth El Capistan Review.) The El Capistan’s Multi Tape Head functions and dedicated Spring Reverb, however, are absent from the TimeLine. If you’re obsessed with tape echo delay, those features could warrant you to have an El Capistan on your pedalboard along with a TimeLine. I, for one, am crossing my fingers that Strymon simply releases an update to add those features to the TimeLine’s dTape machine. Then again, there’s also the excellent Magneto algorithm from Strymon’s BigSky that may satisfy your multi head tape echo cravings nicely. The TimeLine offers way too much delay magic to cover here extensively. Do yourself a favor… Go to the Strymon TimeLine page and just listen to some of the audio samples available. Go on, I’ll wait. Back? Now wasn’t that awesome? Listening to what the TimeLine can do does the pedal more justice than any review ever could. And once you play this pedal for yourself you’ll likely join the many guitarists who have decreed this as the only delay pedal you may ever really need. I’ve already briefly mentioned the Digital, dTape, and dBucket machines. There’s also a brilliant Lo-Fi model that captures the vibe of some of those early digital delay pedals with an unprecedented level of additional control. Lowering the Sample Rate (750Hz to 96kHz range!) and Bit Depth (4 to 32 bit range!) produces especially gnarly results for some truly mangled delay tones. The Reverse machine is another solid addition, providing classic backwards guitar effects and unique atmospheric reversed delay effects. The Dual and Pattern modes both excel at providing delays with even more rhythmic variation. Pattern features 16 different delay pattern sequences, offering plenty of inspiring options that’ll have fellow guitarists wondering how you dialed in the timing of those repeats. The Dual machine provides twin delay lines that may be used in series or parallel for incredibly deep rhythmic delay programming. It’s simple and intuitive to use, so even if you’re unfamiliar with with logic behind using all those note divisions, you could just turn the second delay’s Time parameter until you find a cool sounding syncopated delay pattern that you like. But wrapping your head around how the Dual machine works will certainly help you find the most immensely rewarding delay sounds. Rounding out the delay machines available are the Ice, Trem, Filter, Duck, and Swell models. Duck is Strymon’s take on a dynamic delay, letting delays fill only the spaces between your playing. Swell is the TimeLine’s ultimate ambient delay machine, blurring the lines between delay and reverb. Ice offers crystalline shimmer or sub octave rumblings to your delays by chopping up your signal and shifting the pitch of the pieces to an interval you can set from -1 octave to +2 octaves. Trem adds synchronized tremolo to your delays for a range of pulsating delay effects, very cool for throbbing delay sounds. Filter provides synchronized filter effects that impart some very synth-like tones to your delays with extensive control over the Filter’s parameters. The TimeLine’s 12 diverse delay machines offer a range of world-class delay tones and incredible versatility that surpasses any other delay pedal I’ve played. It’s not hype. The TimeLine is simply that good. While the TimeLine is remarkably easy to use and can function perfectly well in the traditional sense of just slapping it down on your pedalboard and operating it via the 3 comfortably spaced footswitches and perhaps an expression pedal, a whole new world of possibilities opens up to those who seek to integrate this pedal into a MIDI setup. Using a MIDI pedal switcher/router with the TimeLine lets you change presets and activate/bypass the pedal with program changes and continuous controller messages, respectively. Strymon even went the extra mile and added complete MIDI implementation across all of the TimeLine’s parameters. I’ve been controlling the pedal completely hands/feet free with Ableton Live by sending MIDI messages from the DAW to the pedal. This allows possibilities of having very complex delay effects occuring in realtime, completely synchronized to your band’s click tracks or backing tracks. The TimeLine is at the forefront of MIDI effect implementation. It even allows complete MIDI control of all the dedicated Looper’s functions. The TimeLine’s Looper is fully featured and can have its various functions triggered via MIDI from external foot controllers for an even more fleshed-out looping experience. You can route the Looper before or after the delay, and you can still operate the delay functions in realtime while using the Looper. It should probably go without saying at this point, but the Looper’s sound quality is, of course, top notch. There are a couple more features I want to emphasize before wrapping up. The expression pedal control adds excellent realtime performance control and can be assigned to multiple knob functions per preset. Also, if case you’re running the TimeLine in mono, you can use the extra audio in and out as a send and return for coloring your delays with any of your other effects pedals, a nice bonus for further shaping out of this world delay tones. The TimeLine is a monster and one of the best delay pedals around. Let’s see the final result. The Strymon TimeLine is the best all-around delay effects pedal I’ve had the pleasure of playing. With sounds ranging from luscious tape echo and warm analog delay to pristine digital delay and otherworldly rhythmic ambience, all of the TimeLine’s delay machines are beautiful to behold. And with such gorgeous sounds on tap that are also so deeply tweakable the TimeLine has thrown down the gauntlet in terms of delay sound design in a compact pedal. The Looper is brilliant and trumps many standalone looping pedals. Unrivaled MIDI implementation will allow you to integrate this pedal into any futuristic, tech-heavy rig. If I could only own one delay pedal, the Strymon TimeLine would be my first choice without hesitation. That concludes our Strymon TimeLine review. Thanks for reading. 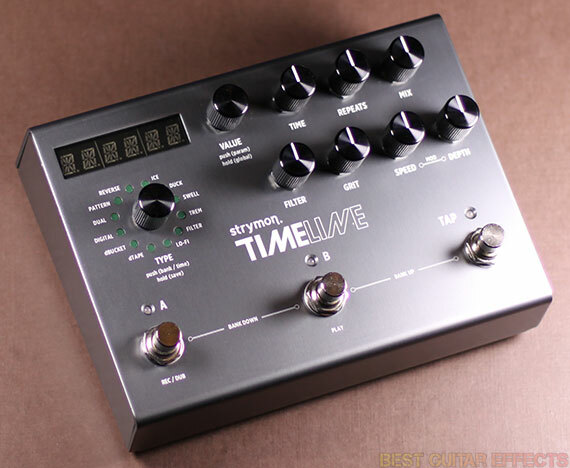 Want to buy the Strymon TimeLine? my wallet is empty… & now this!. I just bought the ‘El Capistan’ on your recommendation & was blown away by it…. Time to start saving up again.. The best delay ever made… I have it for 2 years, and it’s always the same pleasure to hear it, to find anoter sounds…. I Love Delays. This would be my everyday delay. It’s about time I get one of these…. the timeline is the best purchase for guitar I believe I ever made. great write up! The Timeline is like a big sky made of mobius tridimensional space. Yup, I would love to own every ai gle Strymon pedal, but yup, The TIMELINE is just a result of endless research and desication… Nobody can touch strymon when it comes to delay and reverberation. I play my rock and blues through the Stryman TimeLine effects pedal box and found the resulting scorching enhanchments to take it up to the heavenly level that I am trying to achieve. No doubt this is a keeper and look forward to enjoying it to the max during my gigs !!! Simply the best delay pedal on the market for me. I love that it actuall sounds analog-ish on the analog settings, coming from such a digital pedal. bought this pedal 4 month ago. It´s great. Love the Strymon! Thanks for the review.